These days, many homeowners decide to add a Double Glazed Conservatory to their house, as it’s more cost-effective than moving. It’s easy to see why Double Glazed Conservatories are popular; they let you make the most of your garden, whatever the weather. Over recent years, people have been increasing the size of their kitchens with by adding a family dining table or by creating an extra living space. These changes to the home have had a bearing on the way Double Glazed Conservatories link to homes. If you want a conservatory to accommodate a new kitchen or open-plan space to relax in, a single door is an inadequate way to provide access. Having a conservatory requires structural alterations to your, which, although they are straight forward, planning regulations may apply. If you have a more traditional looking home, Victorian or Edwardian styles, and lean-to versions Double Glazed Conservatories are the right type for you. Modern Double Glazed Conservatories are areas flooded with natural light. Their designs are usually bespoke, and they reflect the character of your existing home and your needs. For both of the above styles, we offer uPVC framing, double glazed and triple glazed windows. We also provide extras like stained glass, french doors and mahogany and woodgrain frames. Double Glazed Conservatories are a worthwhile investment; they add value and extra space onto your home. That’s why you should use a professional conservatory company that controls all aspects of your conservatory project: one that deals with the design, the planning regulations and the build. The Advanced Group can do this for you. Advanced offer a bespoke design service. They design Double Glazed Conservatories to suit your individual needs. 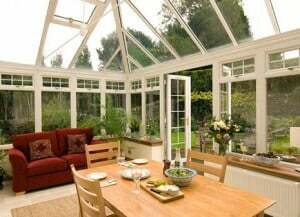 They, also, supervise the build of your conservatory right through to the finish. So, if your looking to speak to someone about Double Glazed Conservatories, call the Advanced Group on 08000 502 502. Or, fill in the form at the top of the page and one of the Advanced team will be in touch with you ASAP.